The Green party has called for investment in national infrastructure to be focused on addressing the access barriers faced by millions of disabled people. The party’s disability manifesto, which was launched this week, and expands on ideas laid out in its main manifesto, also calls for every employer in the country to ensure that at least five per cent of their workforces are disabled people or those with long-term health conditions. And it says it wants to force all local authorities to plan for the housing needs of disabled and older people, while it promises to campaign for a significant increase in the number of accessible homes built over the next five years. There would also be a new Housing Adaptations Fund, a central fund set up to run alongside local authority disabled facilities grants – which the party believes often take too long to provide the necessary funding for alterations – to help people in hospital to “come home as quickly as possible” or find alternative appropriate housing, and which could be drawn on by local and health authorities. The party says it would ensure that future national infrastructure plans would make explicit commitments to improving accessibility for disabled people. A party spokeswoman said: “At the moment, they are not planning for it at all. And she said there should also be a requirement to address the inaccessibility of existing infrastructure, including “vast swathes of housing [and other facilities]that are not accessible”. She accepted that there would need to be a long-term plan to address how the government would go about the significant task of “retrofitting existing buildings and structures”. She said: “At the heart of any infrastructure thinking we would be doing as a Green party, accessibility would be central, both for new structures and for existing structures. But she admitted that this “retrofitting” would need a huge investment, and that the party had no detailed plans for how this would be addressed. The party would also train, support and fund local communities to boost the wellbeing of disabled people and other groups, in addition to its pledge to invest at least £7.5 billion a year to deliver universal free social care. The spokeswoman said this was aimed at “building on a belief that we have that for many disabled people it’s communities, friends, families that are the core infrastructure for supporting us”, and giving communities more of a say in deciding what support was needed. She said: “We believe we can save a significant amount of money by actually finding out from people who need to use services what they want, and actually empowering them to help create those services and help run them. She said the idea was to “tap into the energy of people within our communities” to create “sustainable, empowered” networks of support across those communities, using “all the different resources that are available to us: energy, money, time, tools and equipment that people already have, and make the best use of that. “If we can get people to reconnect, and this is at the heart of Green philosophies and Green politics, it’s about helping us all to connect with each other and be more aware of each other and our needs and our aspirations together and work together. The Green disability manifesto also calls for more central funding to set up community-based organisations to support disabled people into work, while recognising that some sick and disabled people are not able to work. The party says it will campaign for the re-introduction of the Access to Elected Office Fund, which was closed by the government after the last general election in 2015, and had provided funding for the extra costs faced by disabled candidates seeking election to local authorities and parliament. 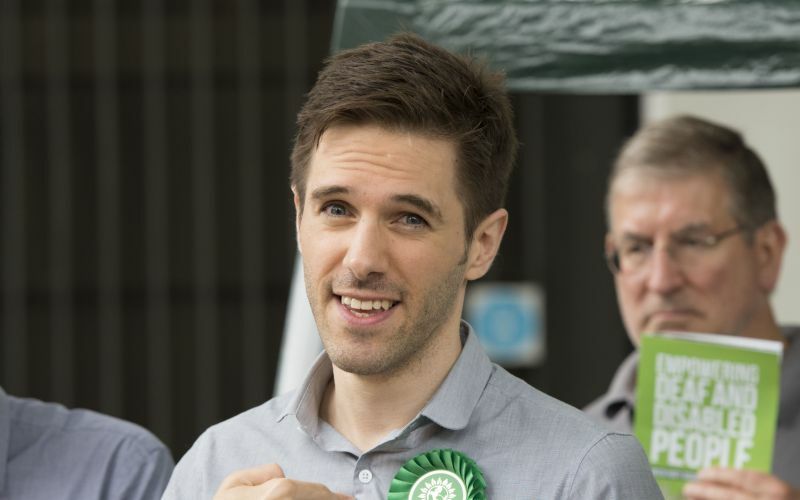 The Green disability manifesto was launched in London by the party’s co-leader, Jonathan Bartley, and Ben Fletcher (pictured), the party’s candidate for Putney, Roehampton and Southfields and the first Deafblind person to stand for parliament. Fletcher said that many disabled people were “still prevented from participating fully in education, in employment, and in politics because of inflexible, outdated attitudes, needless barriers to access and a general lack of understanding about what disabled people can really achieve if they receive the support they need”. He said he was standing for election despite the closure of the Access to Elected Office Fund, and had only been able to stand because of the party’s support. About one in seven of the party’s general election candidates are disabled people. Fletcher said: “Disabled people are desperately under-represented in public life in Britain. Bartley added: “This general election is about the kind of country we want to live in. “Is it the kind of country the Tories tell us we must accept, in which austerity cuts are inflicted on those least able to withstand their impact, including disabled people who already face huge barriers to basic equality? “The Green party refuses to accept that the UK, as the fifth largest economy, cannot do better.